In one of the most surprising announcements from the comic universe in quite sometime, Marvel took to The View this morning to make a major announcement: Thor is no longer Thor. Marvel is excited to announce an all-new era for the God of Thunder in brand new series, THOR, written by Jason Aaron (Thor: God of Thunder, Original Sin) complimented with art from Russell Dauterman (Cyclops). This October, Marvel Comics evolves once again in one of the most shocking and exciting changes ever to shake one of Marvel’s “big three” – Captain American, Iron Man and Thor – Marvel Comics will be introducing an all-new THOR, GOD OF THUNDER. No longer is the classic male hero able to hold the mighty hammer, Mjölnir, a brand new female hero will emerge will who will be worthy of the name THOR. Who is she? Where did she come from and what is her connection to Asgard and the Marvel Universe? 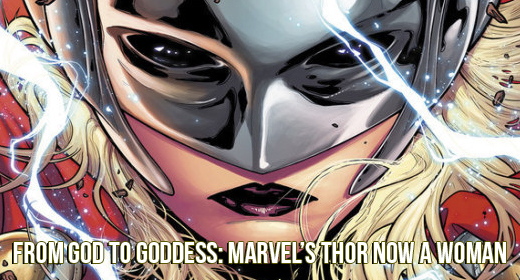 THOR is the latest in the ever-growing and long list of female-centric titles that continues to invite new readers into the Marvel Universe. This female THOR is the 8th title to feature a lead female protagonist and aims to speak directly to an audience that long was not the target for Super Hero comic books in America: women and girls. We want to hear from you! What do you think about Marvel’s announcement? Let us know! New Doctor Who Series 8 Trailer! We Need Your Answers For #TweetTheGeeks! So they have passed the name Thor on to who ever posses the hammer. Much like the name Caesar was once the name of a person, but came to be the title to who ever ruled over the roman empire? I’ve got two problems with this. First, since when is Thor one of the “Big Three” I’m pretty sure Hulk has something to say about that. As does Wolverine. Anyway, I’m sure the “hero formerly known as Thor” will still exist and still be the son of Odin from Asgard. What do we call home now, taking his power takes his name as well? I’ve got no problem with a woman wielding Mjolnir, Wonder Woman looked awesome in the crossover during the 90’s, but to take his name, too. I dunno, it just seems like a publicity stunt. Rachel Huwe liked this on Facebook. Silly… That this is considered a big deal and announced on the view. Larry Benjamin liked this on Facebook.